*Daily value not established. ** Percent Daily Values are based on 2,000 calorie diet. Cellucor C4 Sport is a potent and professionally formulated pre-workout supplement designed to help athletes in all sports related actives. Enhancing physical performance (more energy, more focus, strength, power output), improving endurance (execute for longer without muscle fatigue), and reducing fatigue (both mental and physical). No matter the sport, this pre-workout will lend aid to any athlete. 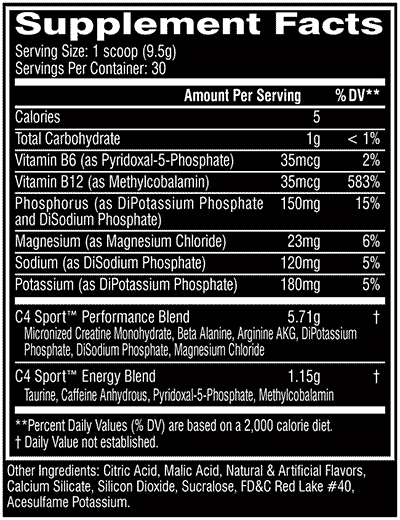 Profile: Cellucor C4 Sport has a simple formulation designed to be effective but not overwhelming. $20 for 30 servings is super affordable when you compare this product to other supplements similar to it. Creatine – Increases strength output and helps build lean mass. L-Arginine AKG – Increases blood flow for better nutrient and oxygen delivery to muscle fibers. Beta-alanine – Increases your capacity for prolonged exercise (boosts mental and physical endurance). Caffeine – Fights fatigue and increases mental and physical endurance. Vitamin B-12 – Used by the body for energy production. Mixability: C4 Sport comes in a container and inside the container is a small plastic scooper that you use to measure out 1 serving. You put the powder into a at least 8oz of water or the liquid of your choice. The powder will mix relativity easily with a few stirs. Taste: After you mix the powder into your water you’ll have to drink it. 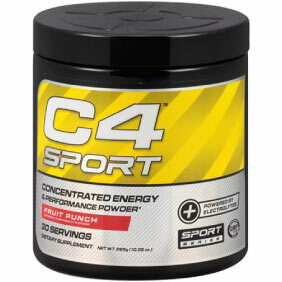 The taste of Cellucor C4 Sport is really tasty and enjoyable to drink. Both flavors, Blue raspberry and Fruit punch are equally enjoyable. Effectiveness:You’ll see and feel a difference straight away. When taken 20-30 minutes before training you’ll start to feel your mind getting more focused (caffeine). During your workouts you’ll feel stronger and be able to preform a few extra reps in each set (beta-alanine & creatine). Overall you’ll feel really good about your workout and be able to perform at a much higher level than before. Worth the $20 if it’ll get you more motivated to train everyday.